The IGH doffers work for all kind of winders and for all type of yarn, like POY, FDY, BCF, HTY, Carbon fibre, Glass fibres, and others. IGH has successfully installed powerful doffing systems suitable to manage more than 9,000 bobbins per day. Among others, IGH has in operation doffers suitable to handle 24 bobbins loaded on 2 spindles at 1800 mm length, suitable to serve the most advanced bobbin winders available in the market. Advanced design concept allows the model HS to run at very high speed in order to work on long winder tunnels without affecting the operators safety, increasing the efficiency of the system. One HS doffer can handle the work of two standard doffers commonly available in the market. 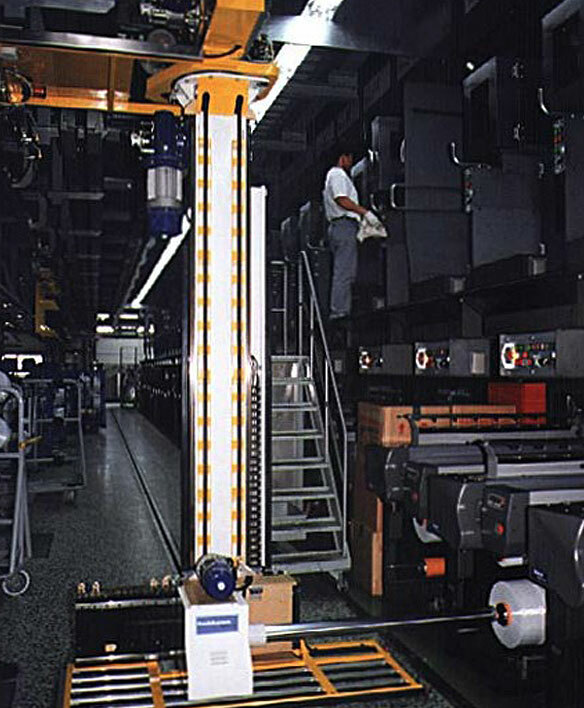 – small doffing units with a capacity of just 2,000 bobbins a day with contemporary management of 20+ production lots and matching requirement of very high flexible production factories. – doffer for a 900 mm spindle 3 packages BCF winder, which requires fast doffing cycle for the BCF high count production.